While scrambling to prepare for my up and coming travels, I have a little time to show you the latest progress on my Shipibo-inspired piece. 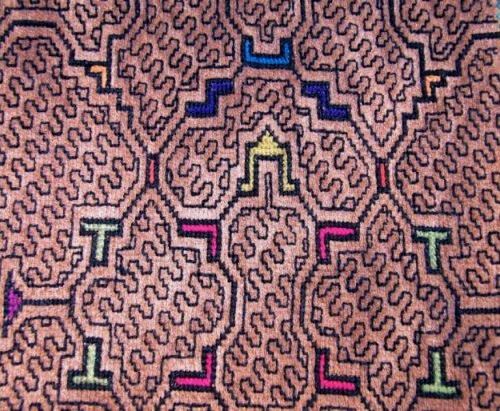 I have spent some time looking about online for more information about the Shipibo designs and my head is reeling with the variety of information that is out there on the meaning of the patterns. 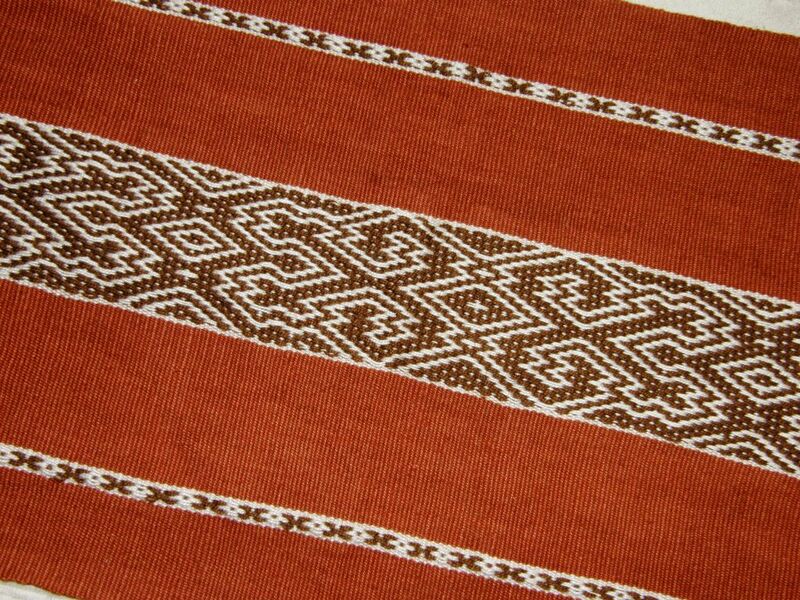 I have heard several versions from my weaving teachers about the meaning of this Bolivian motif. It doesn’t surprise me. I have written here before that I can ask five weavers here in Bolivia the meaning of a certain motif and receive three different answers. I have heard different stories about designs from people even within the one small community. The real question is, do the weavers even want to share this special information with me? Unfortunately, I can’t sing while I weave this piece. It involves a lot of concentration… jumping back and forth from chaotic curvy lines to orderly straight ones. One miscount, that may seem insignificant at first, can add up to a big blooper further down the track. I’ve learned that the hard way! Now…about the songs and the singing. The Center for Shamanic Education is one of the sites from which I learned a little about the Shipibo patterns and their relationship to music. According to this site, the Shipibo people, who live in the Amazon Basin region of Peru, believe that everything is a song and that everything can be sung. 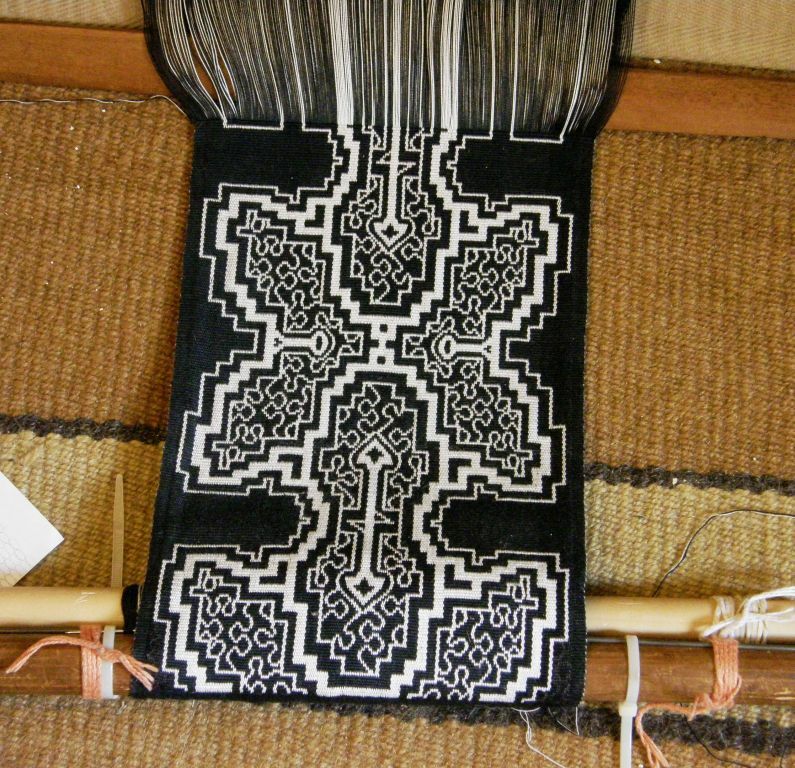 The patterns are called Icaro (another site calls them Kene) and they are woven into or embroidered on cloth and painted on ceramics, houses and skin. At the Encuentro de Tejedores that I attended in Cusco in 2012 anthropologist Dr Luisa Elvira Belaúnde, who also called the designs Kene, talked about the patterns that are tatooed on the skin saying that the Shipibo-Konibo people believe that patterns already exist within the person and are simply made to emerge on the skin. A woman’s body is wrapped in design either in the form of tatoos or by wearing patterned cloth. The Center for Shamanic Education also writes that the Icaro carry healing energy and are a form of musical notation.It says that the Shipibo do not differentiate between seeing and hearing which means that the Icaro patterns in the cloth are constantly singing. What a lovely concept! 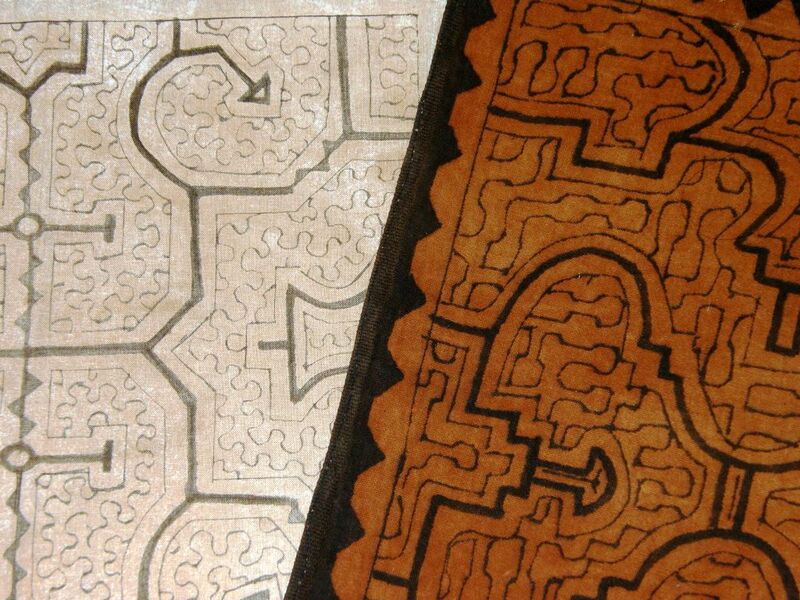 In rituals, Shamans can hear and sing the tunes of songs from the labyrinth of lines in the patterns. The labyrinth of lines…what I have been calling a “curvy chaos” in my own piece…is musical notation to the Shipibo people. 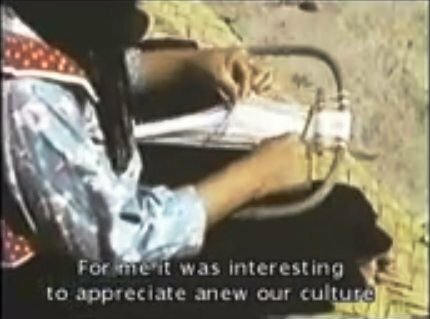 One Youtube video which shows a number of pieces of patterned cloth created by the Shipibo people is accompanied by song and the wonderful sounds of the forest. I have a couple of very small pieces of Shipibo cloth that I bought in a store in Ecuador. I have never been to the Amazon Basin region of Peru. The painting and embroidery are now done on industrially-produced fabric. I wondered if there was anyone still weaving among the Shipibo people. 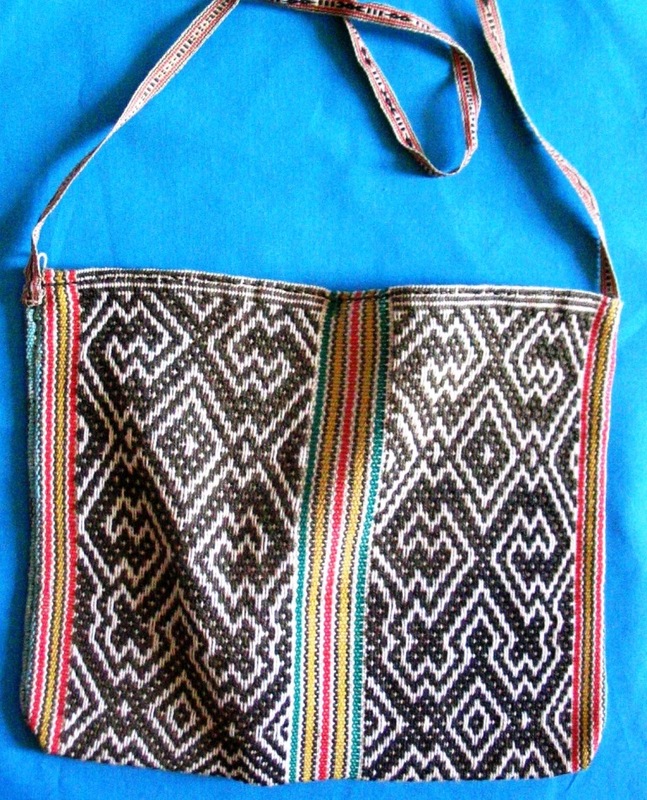 Teyacapan posted a picture of a woven bag from the Peruvian Amazon Basin on her Filckr page. As I had done with my pieces of painted cloth, she had bought the bag in a gallery in Quito, Ecuador. The designs on this bag appear on some of the painted cloth pieces that I have seen. I am guessing that this is the single-faced warp-float technique only because all the lowland weavers that I have encountered so far in Peru and Ecuador who use this structure weave the single rather than double-faced version. I used this design on a placemat that I wove along time ago…. I wasn’t able to find other images of Shipbo woven pieces or weavers until I came across a video, made in 2011, which is the trailer for a documentary on footage that was shot by anthropologist Harry Tschopilc Jr in 1953. The footage has been uncovered in the archives of the Field Museum of Chicago and the documentary covers a project which involved taking the footage and showing it to the Shipibo people. The documentary captures the reaction of the Shipibo people, both young and old, to seeing aspects of their culture and lifestyle that have been lost in the last 60 years. 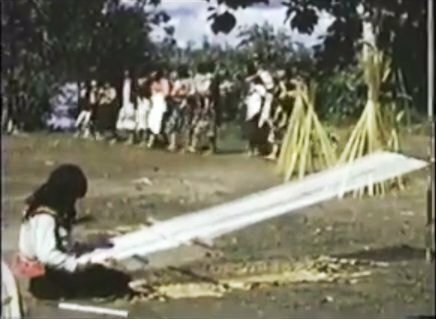 The 60-year old footage shows a Shipibo woman weaving using a backstrap loom as well as one weaving on a small frame that could have been made from a bent tree branch. There is also recent footage of a woman using a backstrap loom to weave a very long and colorful narrow band. I try to imagine the sounds of the forest that you can hear on the first Youtube video in this post as I sit at my loom. The weavers most likely have the songs of the Icaro in their heads as they work. Right now, I hear planes droning overhead, the sounds of car alarms and the rumble of the big plastic trash bins as they are wheeled out to the street…life in the city! There are two quite long Youtube videos, parts 1 and 2, that show the process of creating the painted patterns on the cloth here and here. Again, there is song and forest sound in the background…lovely. So, I will continue with my wall hanging panel. It will be flanked by panels of deep red and I will join the three panels at the top with weft twining. 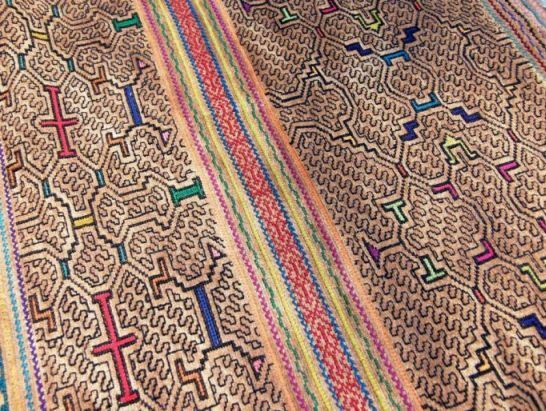 I hope to twine a pattern that has been inspired by the work of the Shipibo people. Maybe now you can understand better what I was doing when I was on the floor a few weeks ago drawing squiggles. I had seen wavy lines amongst the hairy wool warp threads on which I had been working a few months ago and from that was born the idea for this Shipibo-inspired work. Fantastic post! Thank you so much for digging into the Shipibo history and presenting this to us. You are an excellent historical anthropologist as well as textile master. Wow! 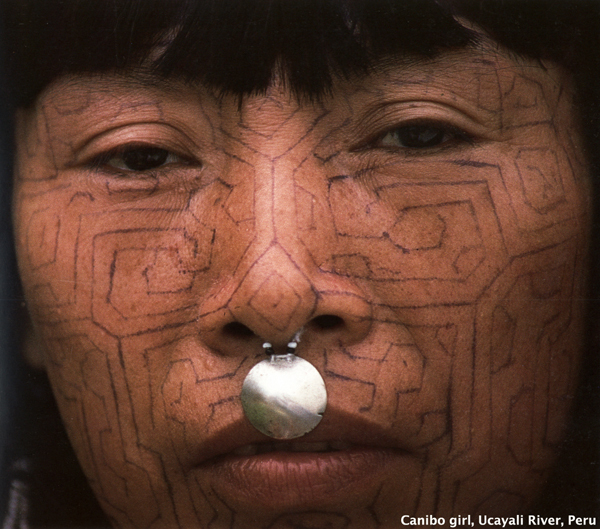 Really enjoyed this blog post about the Shipibo people and their art. The textiles are amazing, and I like the pottery and singing, too. Good luck/good weather on your trip. Laverne, your posts are always FASCINATING. Amazing patterns, Laverne! Including in your weaving…And the trailer/documentary is really moving. The rapt attention of everyone even the children watching the old footage, and how they talked about it afterward. Thanks for this great post. Thanks, ingrid. I, too, was delighted by how the children reacted. See you soon at CNCH. What a beautiful way the Shipibo have of illustrating the combination of order and chaos – the similarities and differences within us all. That’s a beautiful way of thinking about the contrasts. As always, thanks for your message, Julia. I’m glad you stuck with your Shipibo…it is beginning to sing! Me too. It has certainly grown on me after so many doubts during the entire preparation process. Una vez más, gracias Laverne por compartir tanta belleza. A pesar de que el traductor de Google me está jugando una mala pasada… los textiles y las culturas que los sustentan tienen un idioma universal, no? It may seem strange, but as I red your posting, I could almost hear the patterns sing to me. Great inspiration and I just love the history behind this weaving. Thanks Laverne. As always you inspire me to keep weaving! Hi Vicki.I like to imagine them singing to me too! 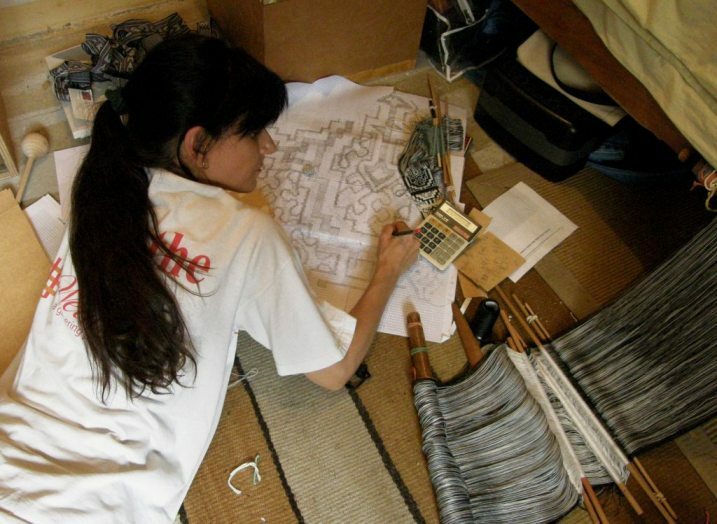 I have noticed in some of your blog posts that you take pictures of your projects on top of pieces with icaros. I was never too familiar with what they were until my boyfriend and I went to Peru late last year to attend an Ayahuasca retreat with four shamanic ceremonies. While there, we went to a Shipibo village and bought some of their hand-made pieces, all woven with icaros throughout. Very beautiful, and when I look at our souvenirs (and see yours! ), I am reminded of the shaman singing the different songs, late into the dark, dark night, and the adventures I went on. Thanks for sharing your mmemories. I have never been to that part of Peru. Imagining the jungle at night with all its sounds and the singing of a Shaman gives me chills. Wonderful posting I have a few pieces of Shipibo cloth but had no idea about the singing what a lovely way to express the designs. Your piece is going to be magnificant looking forward to see it finished in due course. Thanks, Judith. It’s nice to hear from you. I’ll be visiting with Betty in May and for sure we will be thinking of you. So glad to stumble across your blog! we just moved to Bolivia last month and I am dying to learn to weave. I spin and knit at present. We are in Coch until July or August, then will be living in SC for at least 3 years. How should I get started? Studying Spanish 4-6 hours a day for the next few months,but can communicate well enough to learn I think. (As long as it isn’t Quechua or Aymara!) Love to meet you when we all get back to Santa Cruz! Hi Kim. Nice to meet you. I am not so familiar with weaving ops in Cochabamaba city itself, but perhaps you could seek out the ladies that sell spindles at the market. They are often the same ladies that sell home remedies. Take along your own spinning and knitting to show. That is always a good icebreaker. It’s not so easy to find weavers in the city. I know that there are some stores in the city that sell goods from the weavng co-ops that are out in the country. They may be able to provide contacts too. We can catch up when you get to Santa Cruz.